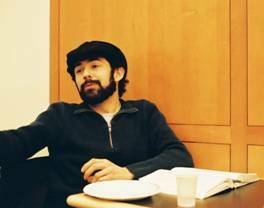 Colin Reynolds is working in 20th-Century U.S. political and social history with Prof. Crespino. 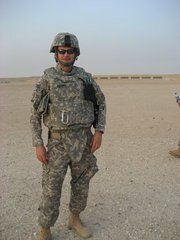 Alexander Lorenzo Colonna is currently serving at a Combat Support Hospital in Iraq. Alexander Lorenzo Colonna, B.A. in History, French and Pre-Med, 1998, is a Major in the U.S. Army Reserves. He is presently serving at a Combat Support Hospital in Iraq. Last fall, he wrote, “Well I’m finally all grown up and finished with many long years of medical training. I went to med school at MUSC in Charleston, did my General Surgery residency at ETSU in Johnson City, TN, and did an Acute Care Surgery fellowship at Wake Forest. 12 years of work in all.” He is married and his wife, Sarah, did her medicine residency at Wake Forest. Now she is doing a Hematology/Oncology fellowship at Vanderbilt. Their son, Gabriel, is almost two years old. Alexander started a general surgery practice outside of Nashville. 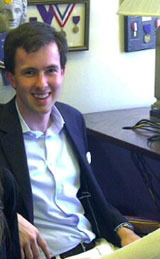 Patrick Jamieson won the 2011 Matthew A. Carter Citizen-Scholar Award. 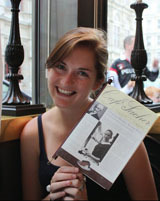 Kirsten Cooper enjoys some Sacher-Torte at the Café Sacher in Vienna. Kirsten Cooper, Class of 2012, is spending the summer of 2011 doing historical research with the SIRE Summer Research Partner Program. She will work 40 hours per week on two projects: one under the direction of Dr. Tonio Andrade and the other an independent pursuit. She has worked with Dr. Andrade over the past year on his comparative exploration of military development in Europe and Asia, looking specifically to see whether or not the Military Revolution was a purely European phenomenon. Her independent research will focus more on military and diplomatic relations between France and Austria, and their consequences on various facets of society and national consciousness over the approximately 250 years leading up to the Diplomatic Revolution of 1756. She will also study the effects that this event had on the two societies. This research will help inform her upcoming honors thesis. She explains that she “is very excited to get the opportunity to work full time on both of these projects and to spend the summer in our amazing city of Atlanta!” Last summer, she went to Vienna with the German Studies program and began learning German (taking 101 and 102 while abroad), which she has continued at Emory over the past year. She writes, “It was an amazing experience and I absolutely fell in love with the city, its culture, and its history.” As part of her work, she conducted an independent survey course of Austrian and Habsburg History with the help of Robert A. Kann’s A History of the Habsburg Empire, 1526-1918. She enjoyed eating in the Naschmarkt, a lovely open air market with great restaurants, and riding the Strassenbahn through the city. The obligatory tourist stop at the Café Sacher for their famous Sacher-Torte was a special treat. Kate Armstrong and her family celebrate her May graduation. 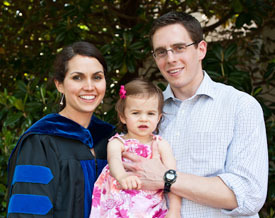 Kate Armstrong, Ph.D. 2011, writes that she is thrilled to have completed her doctorate, directed by Professor James Roark. The dissertation is entitled, “Thy Will Lord, Not Mine: Parents, Grief, and Child Death in the Antebellum South.” The research for her project took her to archives in Virginia, North Carolina, South Carolina, and Georgia. It was supported by fellowships from Duke University’s Sallie Bingham Center, UNC-Chapel Hill’s Southern Historical Collection, and Emory. The dissertation investigates the emotions and experiences of planter-class parents of the Old South as they grieved the death of a child, and argues that southern parents’ profound difficulty aligning their feelings of loss with the expectations of their society–particularly the expectation that parents must resign themselves to God’s will–defined their grief. Although Kate is looking forward to revising her thesis for publication, she is also happy to focus on her own, very healthy child for a little while as she figures out her next career move.